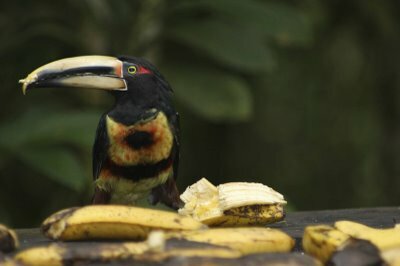 Collared Aracari chowing down on bananas. After 3 hours on the bony back of a mule, in a state of delirium, I took a moment to realize where I was in the world and how I came to be on this strange trek. The journey to Bilsa Biological Reserve is not for the meek traveler. After a 6-hour bus ride from Quito along the sheer cliffs of the Andean mountains, I waited in a nameless town another few hours near a pharmacia as vaguely instructed. I waited (as patiently as an anxious foreigner can) for my transportation not knowing what to expect. Finally, a door-less passenger converted flatbed truck, known as a rancho, rolled to a stop with salsa music blaring at full volume. I stepped aboard, relieved to be in motion again. The truck bumped along, stopping every 5 minutes. Men hung off the sides, chickens squawked on the roof, and women miraculously breastfed their babies while I could hardly help from being tossed side to side. The loud music gave the odd scene an exciting flavor and the surrounding jungle grew thicker as we climbed into the lowlands of the Esmeraldas province of northwestern Ecuador. We arrived at La Ye de la Laguna , which is exactly what it translates to; a Y in the road near a lagoon, a town that consists of 2 restaurants, one phone booth and 4 houses. We pulled into the center of the town and children, old men and women gathered around to watch me struggle to pull my gigantic backpack from the roof of the rancho. A woman soon asked if I was a voluntario and I nodded. She smiled, took a breath and then shouted quite literally at the top of her lungs, “MAXIMO!” in no direction in general. An elderly man looked up from playing with some children across La Ye. He instructed me to climb into the back of a pickup truck and soon I found myself flying over hills splashing through mud puddles. The sky began to glow pink. The truck dropped me off at a farm where I was told I would sleep for the night. I looked with apprehension toward the farmhouse. The mother of the house looked somewhat confused as if she was not expecting a guest for the night. She asked me to wait one minute as she shoed chickens and ducks out of my room with a broom and began to sweep. The farmhouse, owned by the Zambrano family, was covered in thin layers of dust and mud but my concrete room felt comfortable and was complete with a mosquito net over the bed. I warily gazed around for malicious mosquitos, recalling that the area is known for having high rates of malaria. Chickens and ducks waddled by and peered into my room, making angry farm fowl noises in protest. I closed the door to get some privacy from their beady eyes. Chickens can be friends too. I started to walk toward la Languna but the road seemed to never end and I started to grow hungry. I did meet many locals passing by who wanted to know who this gringa rubia was and where she was from. I returned just in time for a mild dinner of rice, omelet and plantains. It was delicious. I finished my meal and tried to create a conversation with my broken Spanish. Suddenly, a bat flew in (perhaps due to the lack of windows) and began to circle the room. The family chuckled as I flinched when the creature flew toward my face, obviously a common occurrence. The next day I awoke early to explore the farm. I emerged into the sunlight and saw two small silhouettes tramping through the mud towards the house. The niece and nephew of the house seemed to have already proclaimed themselves my under aged guides. Liliana, 5, and Marcelos, 4, eagerly beckoned me deep into the property. ¨Que lindo!¨ Marcelos exclaimed at every animal and plant he showed me. 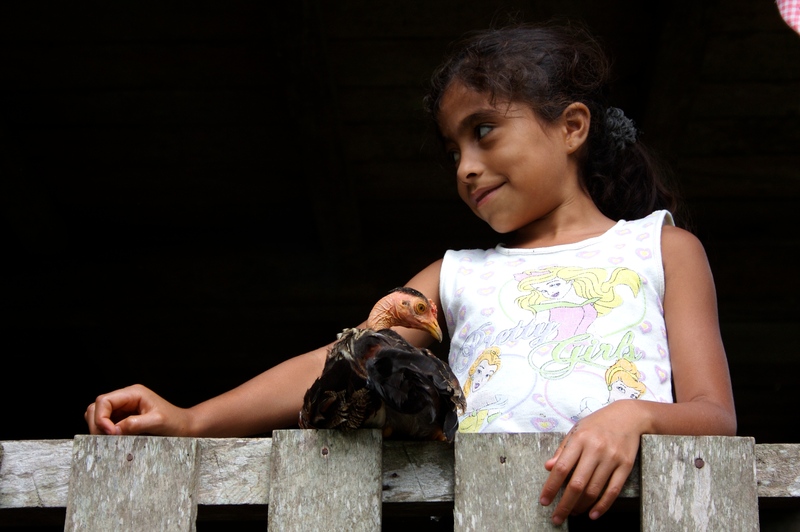 The children introduced me to pigs, chickens, cacao trees, butterflies and a small river they convinced me to cross. I felt a twinge of sadness as I said goodbye to my newfound fellow explorers. 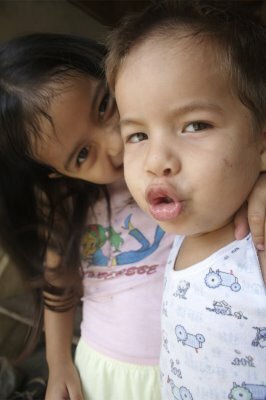 Liliana and Marcelos: my fellow explorers. I caught another truck back to La Ye, where I was told to wait for Don Almado to meet him at 11 am. After a few hours of waiting I began to question my mission. I had set out to volunteer at Bilsa Biological Reserve, to study plants and animals and learn to live in the equatorial jungle. I wondered if I would ever really get to Bilsa. Suddenly a man with a huge grin and beads of sweat across his face extended his hand. Although it was already 2 pm I felt excitement rush through me as I shook his hand; I was eager to leave the hot, muggy, midday scene of La Ye where mangy dogs roamed too close for comfort. The road to Bilsa is 14 kilometers long and thick with mud. 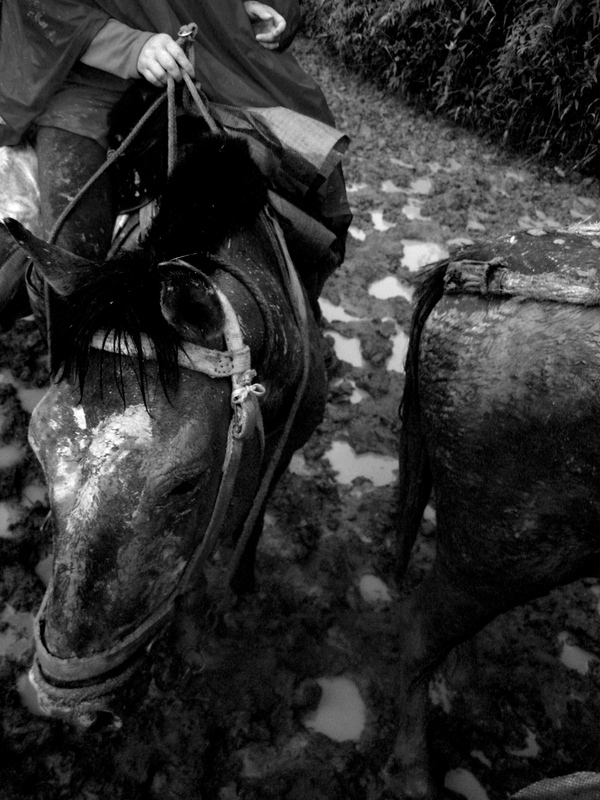 We loaded up the mules and began down the muddy road. The road followed a ridge through lowland mountains and winds through sparsely settled farmhouses. The mules were excruciatingly slow. I thought to myself…I could walk faster than this…They avoided the mud at all costs and would walk on the edge of cliffs to stay away from the deep parts. I soon discovered why the road was not manageable for 2 human feet alone. 4 legs are a necessity. In some places the mud was unavoidable and it came up the mule’s chest. I was soon splattered in mud but enjoying the ride. The layers of trees produced shades of green I did not know existed. Night gently fell and the green hills faded to black. Tiny lights sprinkled the area surrounding the path. Small glowing insects gave the illusion of lanterns in the distance. After the 5-hour mule ride, my joints ached. I felt very sympathetic for the mule’s amazing feat of endurance. Finally, with a sigh of relief and exhaustion, we reached a small painted sign that simply said Bilsa Biological Reserva. We entered the barbwire gates and stumbled with numb legs down a boardwalk toward an illuminated structure and the hum of a generator. I could hear a dog barking and guitars rhythmically playing. After a brief introduction we learned the first and foremost rule at Bilsa; wash your boots before anything else. Everything at Bilsa revolves around mud. 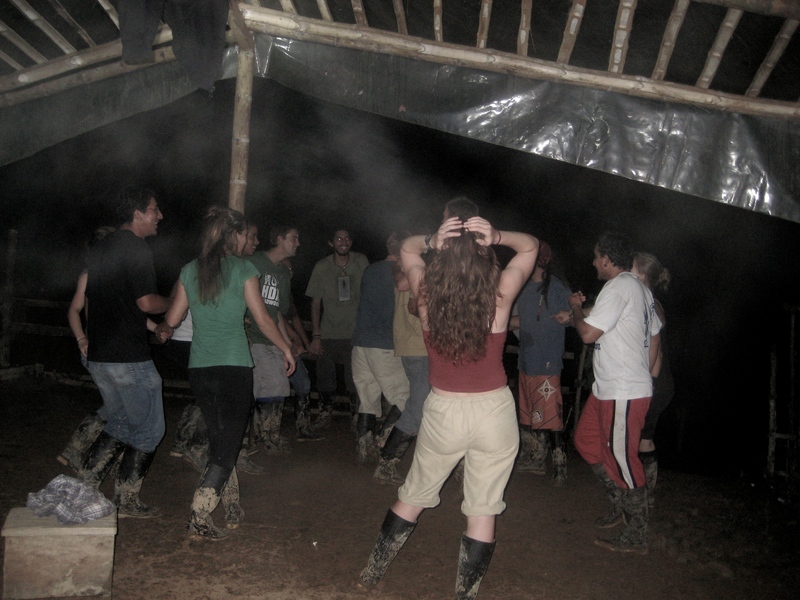 Learning to salsa dance in the mud. I met the other volunteers while we devoured a simple but delicious dinner. Little did I know what good friends these people would become and how I would relish each meal at Bilsa. During the next three weeks I would learn the techniques of hiking (and falling) in mud, spotting birds through thick foliage, camping in the jungle, climbing waterfalls, harvesting bananas, catching frogs at night, savoring cold showers and salsa dancing in the mud. 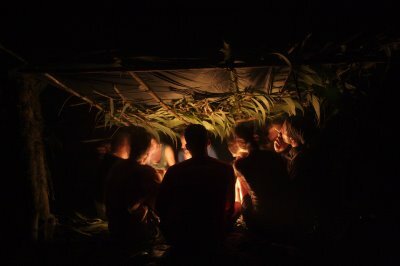 Jungle hut we built while camping on a rainy jungle night. Bilsa was the driving force behind my desire to become involved in field biology. I have never experienced such amazing biodiversity. For example, in a square meter you might find tarantulas, caterpillars, frogs, snakes and other insects all living within centimeters of each other. The canopies are equally diverse and home to numerous primates, mammals and birds. 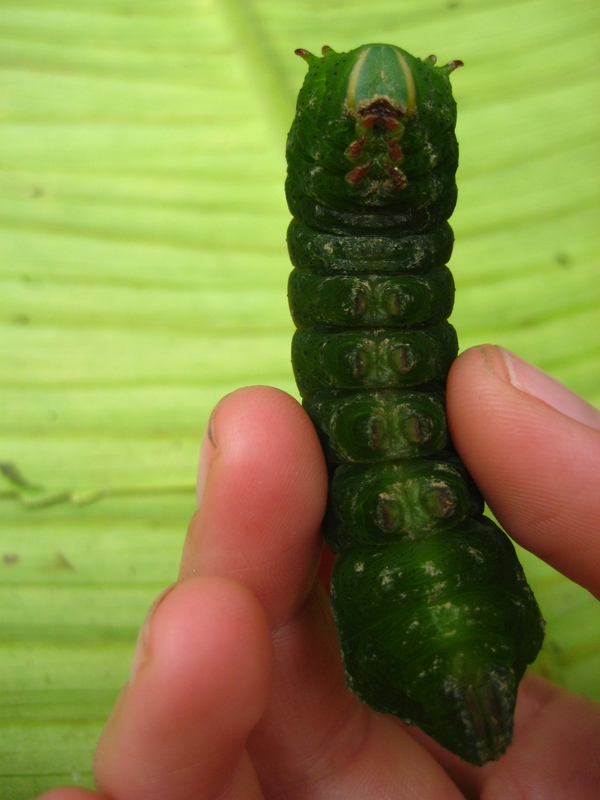 Amazed by overwhelming biodiversity, I learned to love the wildlife of the jungle, which gave me a greater appreciation for different ecosystems no matter the geographic location. The sense of adventure and the possibility of discovery that Bilsa emanated made me realize that I want to spend my life studying and exploring the beauty of the natural world. A glass frog, a new unnamed species discovered at Bilsa. The study of nature is a limitless field, the most fascinating adventure in the world. What an experience of a lifetime! I really enjoyed this. This. Sounds. Amazing. 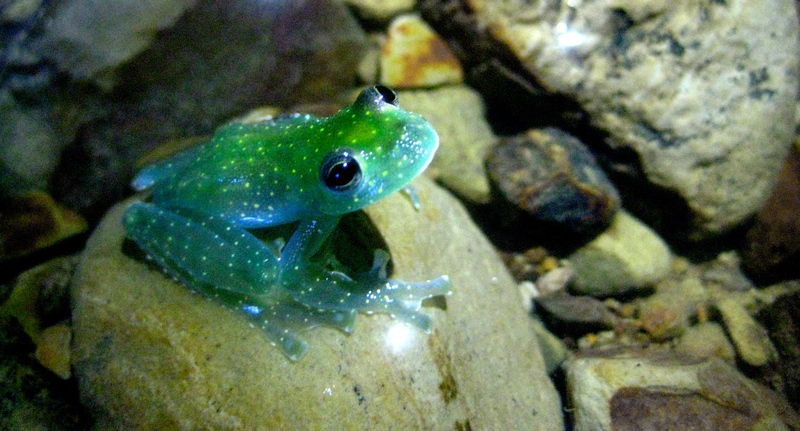 And the glass frog looks magical!